Time lapse of the Partial Solar Eclipse occurred last March 9, 2016. Set of images were taken at Rizal Technological University, Boni Avenue, Mandaluyong City and approximately aligned. Few clouds were present during the course of imaging that makes the color of the Sun change in some frames. 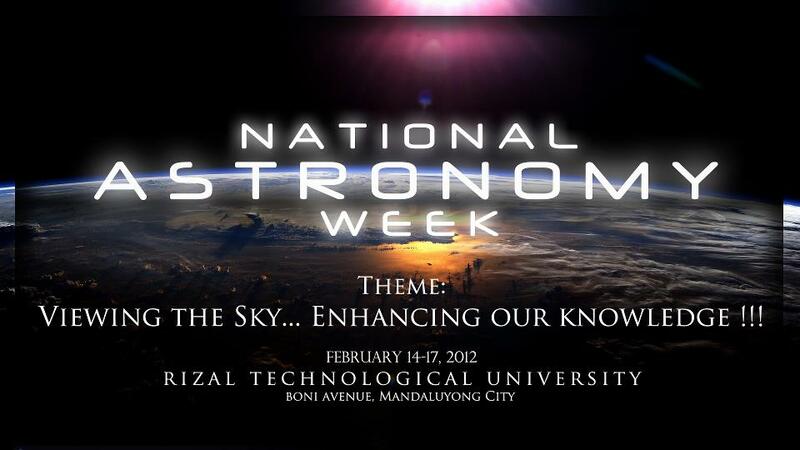 To have an outreach program which will enhance public astronomy awareness. To be able to establish a name that would be easier and remarkable to remember. 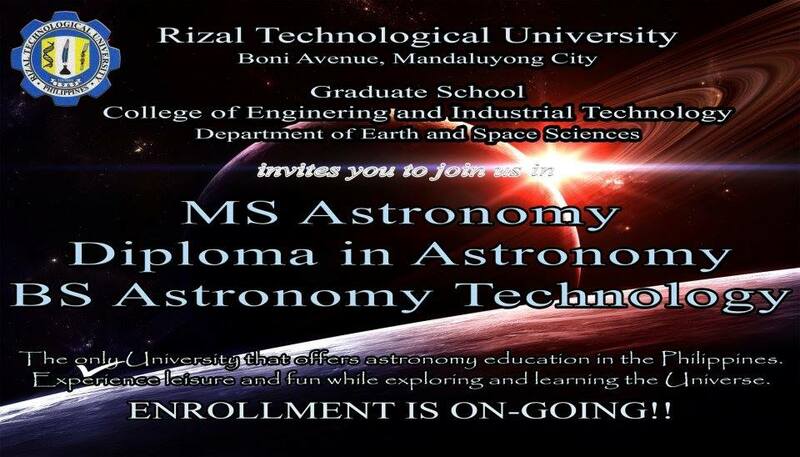 To exploit astronomy education as a learning process with arts and sciences. To show the beauty of the Universe not only through lectures but also through observation by means of star gazing activities. Most of the world of science is powered by collaborations between different scientific communities. These bonds help with the exchange of ideas and technologies which, in turn, makes scientific research more engaging, innovative and worthwhile. 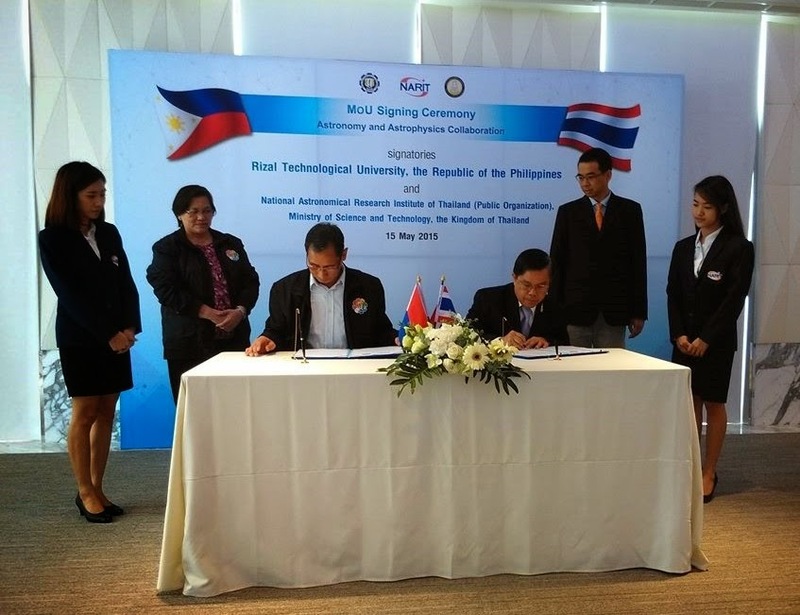 Such is a vision that a Memorandum of Understanding (MoU) was signed between the Rizal Technological University and the National Astronomical Research Institute of Thailand (NARIT) last May 15, 2015. Dr. Jesus Rodrigo F. Torres, the president of RTU, together with Dr. Edna Aquino, RTU’s Vice President for the Research and Extension Services; Engr. 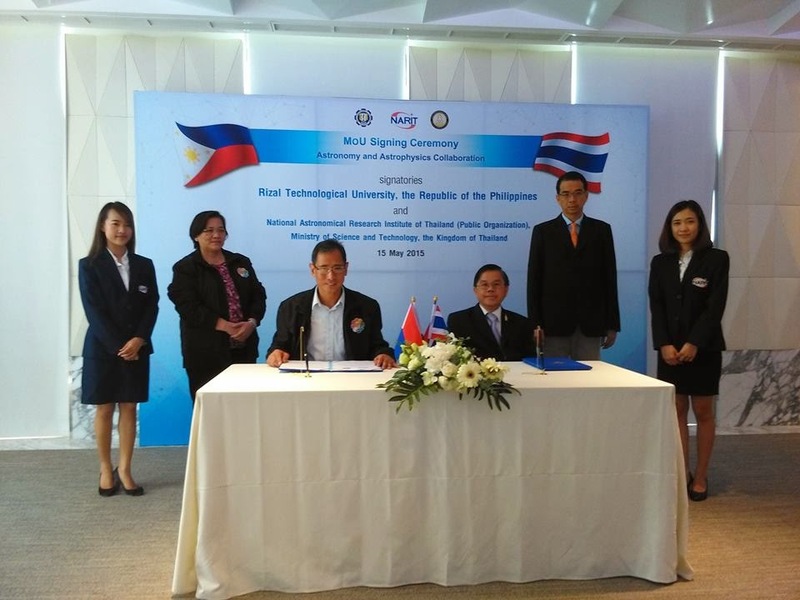 Ricardo N. Nasuli, the Dean of the RTU College of Engineering and Industrial Technology; and the Department Head of the RTU Department of Earth and Space Sciences Dr. Ruby Ann Dela Cruz headed to Thailand last May 13, 2015 for a three-day stay at Chiang Mai Province where both the NARIT and the Thailand National Observatory (TNO) is located. 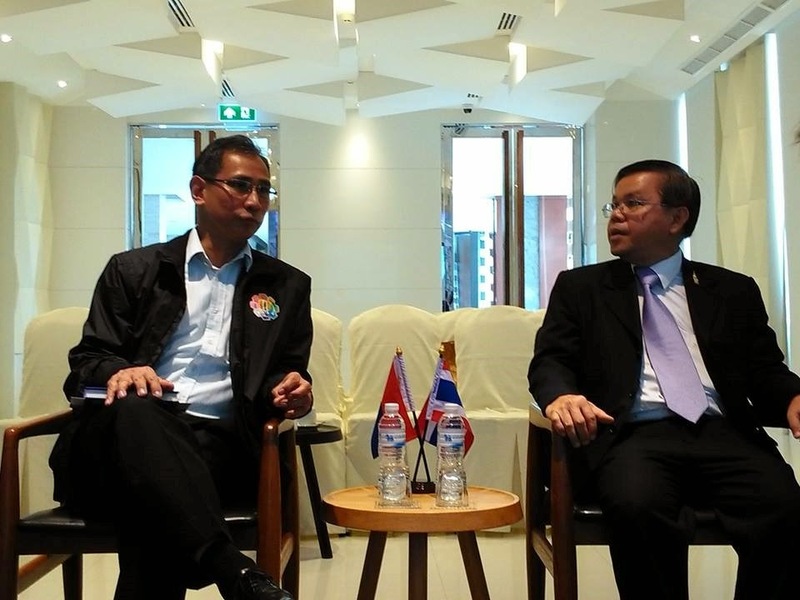 Afterwards, on May 15, 2015, the MoU Signing Ceremony was held inside the NARIT premises. 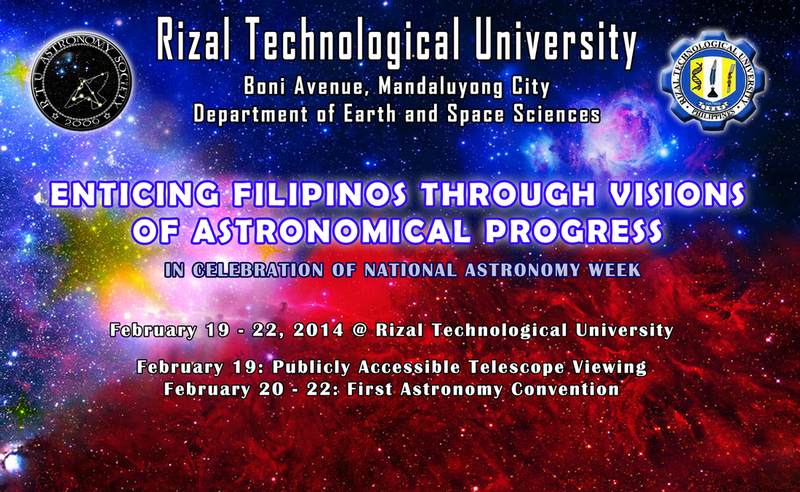 In the event, Dr. Torres did a concise speech about the past and current astronomy-related events held by RTU. He also discussed the current research and extensions of RTU, together with his future plans for the University. 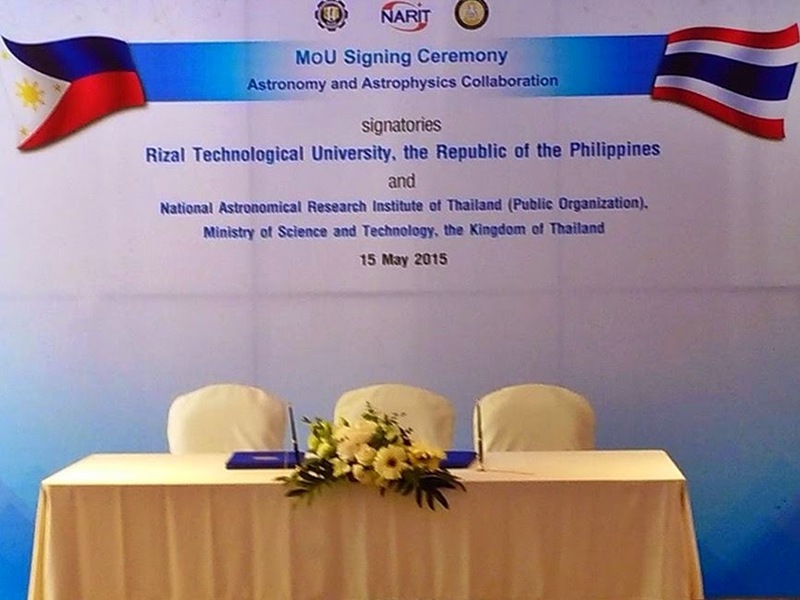 The MoU is aimed for collaborative research, training of both teachers and students, curriculum development, as well as for the joint effort in transferring knowledge and awareness in astronomy between NARIT and RTU. We from the RTU are deeply thankful to Dr. Boonrucksar Soonthornthum and all of the officials of NARIT for having a MoU with us. We are heartily looking forward for the future outcomes brought upon by the new partnership. 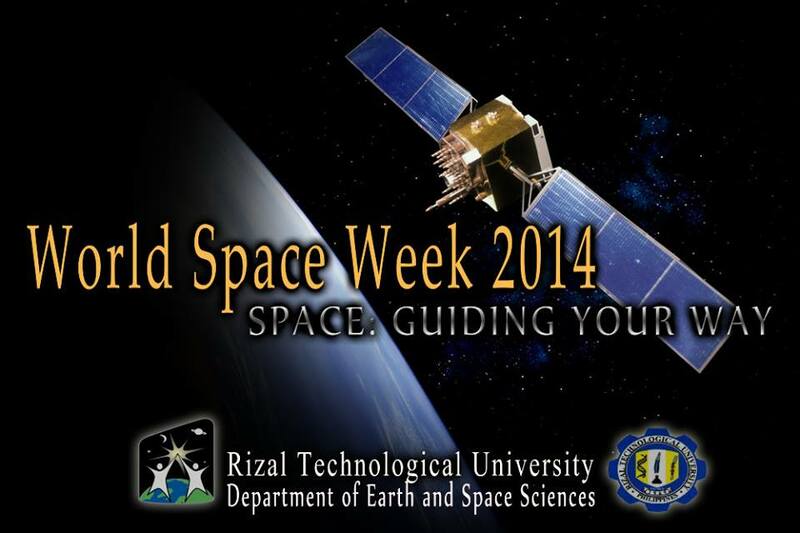 The SEAAN 2014 will be held at Rizal Technological University, Mandaluyong City, Philippines on 16-17 December 2014. 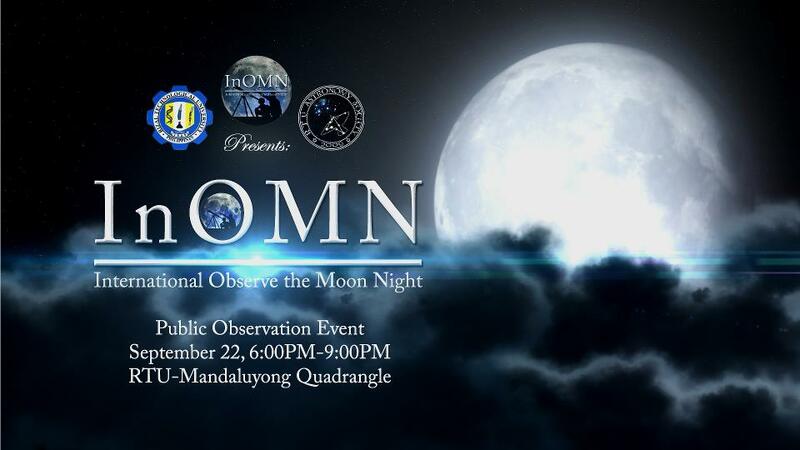 The event will be sponsored by the Department of Science and Technology (DOST)-Philippine Atmospheric, Geophysical and Astronomical Services Administration (PAGASA) and the Rizal Technological University (RTU). In addition to the National Focal Points and 20 participants from the SEAAN member countries. Interested local astronomy organizations should register online and are advised to observe the important dates (November 19, 2014 deadline of subsmission of registration form). 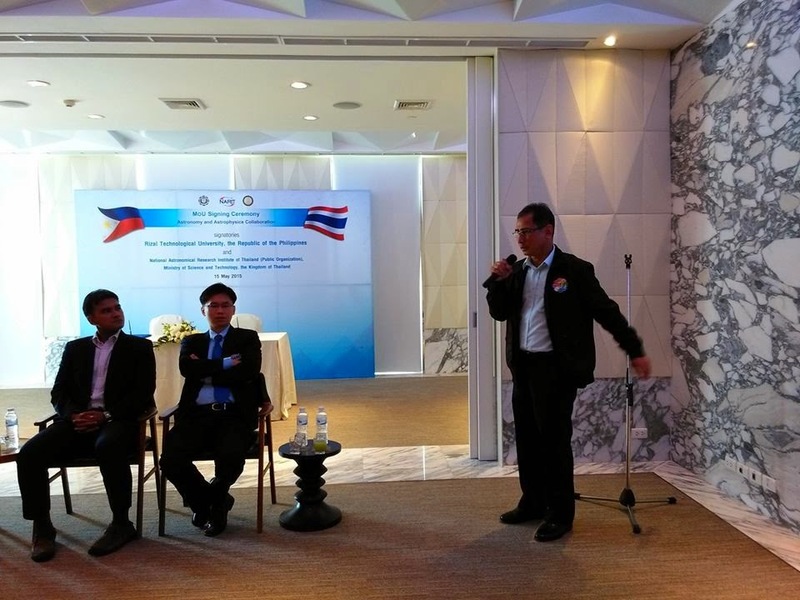 The Conference aims to promote cooperation in the field of education, research and popularization of astronomy among Southeast Asian member countries. It will be divided into business and scientific sessions. The business session will be the 6th SEAAN Meeting and will be held on 16 December 2014. The scientific session will be held on 17 December and will include plenary and invited talks and oral and poster presentations. Please download and complete the registration form below and submit to Ms. Ruby-Ann dela Cruz, Head, Department of Earth and Space Sciences, RTU through her email address: ﻿﻿bee1delacruz@yahoo.com﻿﻿. -Travel expenses and accommodations will not be shouldered by the organizers. -You will receive an email of confirmation if you have successfully registered as participants. 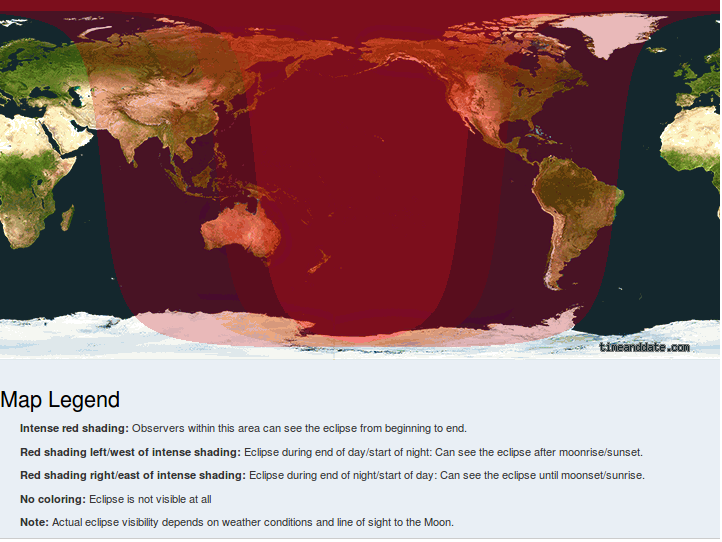 There will be a Total Lunar eclipse on October 8, 2014. According to PAGASA; "In Manila, the Moon will rise at 5:34 p.m. on 8 October and will set at 6:16 a.m. on 9 October," First contact would start on 5:17PM PST (Below the Horizon), the maximum eclipse would happen on 7:55 PM and the eclipse would end at exactly 9;32 PM PST. 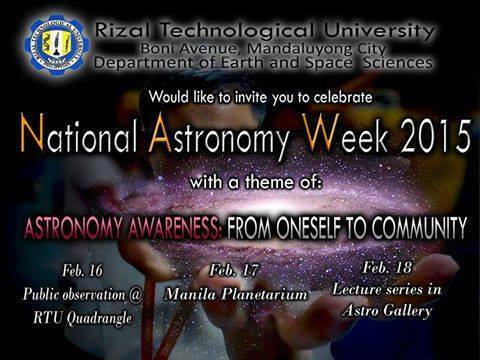 RTU Astronomy students and Faculty will be observing this event at RTU quadrangle, please feel free to join us. 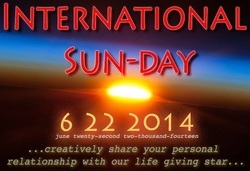 ﻿The Solar Observation Program is an official participating partner to the International Sun-Day celebration on June 22, 2014. It is a global non-profit event to celebrate the Sun and share your personal vision of what our life giving star means to you. The Eta Aquarid meteor shower is an underrated shower compared to more popular ones like the recent Lyrids. But it actually has one of the highest ZHRs, after the Geminids, Quadrantids, and Perseids. It’s a variable shower, so its ZHR at maximum varies from year to year. It can be as low as 40 and as high as 85. This variability is periodic though and can be predicted. The IMO predicts a peak ZHR of about 55 meteors per hour this year. The shower peaks when the earth is at a point in its orbit that the sun is at ecliptic longitude λ⊙ = 45.5°. This year it occurs at 2014 May 06 07:14 UTC. This is about 2014 May 06 15:14 in Philippine Standard Time. Since the peak occurs at daytime in the Philippines, it is fine to observe either the night before (May 5-6) or the night after (May 6-7). This is a broad shower so it would not make much difference if observation is not done during its peak. The radiant rises at 01:32 AM and reaches its highest altitude in the sky at 7:33 AM, at which it will be 74° above the astronomical horizon. This is already morning so we can expect increasing observed hourly rates during the dawn. The First Quarter Moon will not interfere though. The moon sets at about 11:16 PM even before the radiant will rise. The Zenithal Hourly Rate (ZHR) at its peak is 55 meteors per hour. As usual, do not expect to see this amount. Assuming a limiting visual magnitude of 5.0 in a moonless urban Metro Manila and a population index of 2.4, radiant altitude of 74°, and zero cloud cover, the Observed Visible Hourly Rate should be about 14.2 per hour. 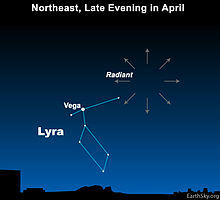 The Lyrid meteor shower peaks on Wednesday morning at 1:48 AM. The best night for overnight observation is therefore Tuesday night to Wednesday morning. Though called Lyrids, the radiant at RA 18h 04m, Dec +34° is actually in Hercules. The radiant reaches its highest altitude in the sky at 3:57 AM, at which it will be 70° above the astronomical horizon. The Last Quarter Moon may interfere though. The moon rises at 12:41 AM and transits at 6:39 AM with a magnitude of -9.9 and 44.3% of its disk illuminated. It's about 60° from the Lyrid radiant. The Zenithal Hourly Rate (ZHR) at its peak is 18 meteors per hour. However, do NOT expect to see this amount. Assuming a limiting visual magnitude of 4.5 in urban Metro Manila with a population index of 2.1, radiant altitude of 70°, and zero cloud cover, the Observed Hourly Rate should be about 3.8 per hour. The Lyrids are known for their fireballs. They may not be as many as the Geminids, but they are long, bright and fast. Specifically, the type of cloud that produces halos is called "cirrostratus nebulosus". The nebulosus species is featureless and uniform and is formed by gently rising air. It is shaped like a blanket. If the sun or moon shines through this kind of cloud, a halo is formed. Cirrus clouds are made up of ice crystals that are usually hexagonal in shape. These kind of crystals usually refract light by 22 degrees. Thus it forms a halo 44 degrees in diameter. Because of the different wavelengths, the inner side of the halo is usually reddish while the outer side is usually bluish. The red halo is 21.54° in radius and the blue halo is 22.37° in radius. That's why it looks somewhat like a rainbow around the moon. Expect more moonbows in the days to come. On average, the coldest day of the year in Metro Manila occurs on Jan 26, so it is still getting colder for the next two weeks. It happens during cold weather because ice crystals in the upper atmosphere refract the moonlight. 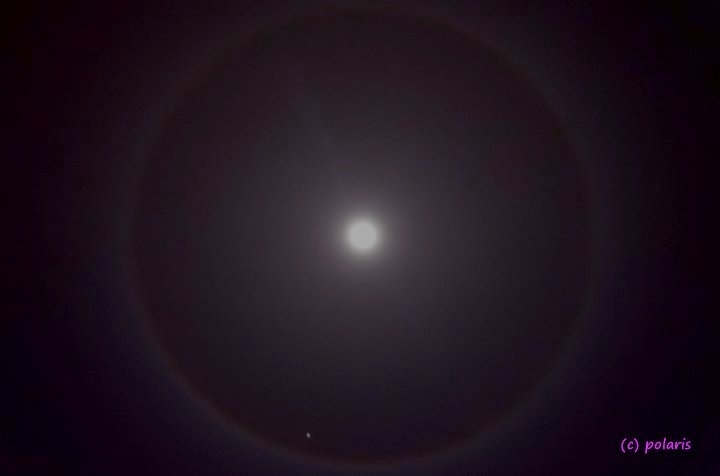 Hexagonal ice crystals in thin cirrostratus clouds bend the moonlight 22 degrees, forming a halo 44 degrees in diameter. And no, it doesn't mean bad weather. Lunar halos are common during January, the coldest month of the year, but on average January also has very little rainfall. Therefore our climate patterns show little correlation between moonbows and rainfall. 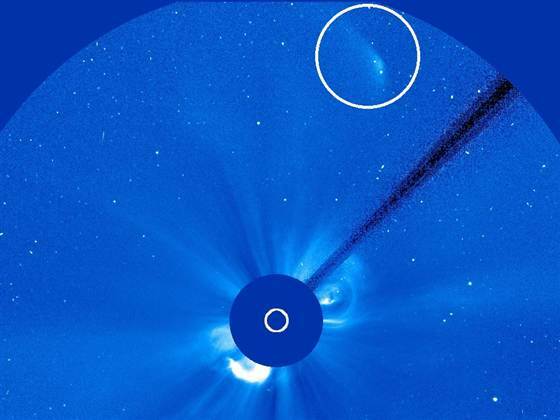 The white circle highlights Comet ISON's remnants toward the edge of the viewing field for the Solar and Heliospheric Observatory's LASCO C3 ultraviolet detector. The sun's glare is blocked out by an occulting disk, but a solar storm can be seen emerging toward the lower edge of the frame. Remnants of the object once touted as the "comet of the century" passed through the viewing the field of Solar and Heliospheric Observatory in the wake of Thursday's close encounter with the sun — and as it passed, the bright spot that survived grew dimmer and dimmer. ISON's obituary had been written before, on Thanksgiving Day, when a different sun-watching satellite known as the Solar Dynamics Observatory failed to see the comet as it was due to pass within 730,000 miles (1.2 million kilometers) of the sun. Comet ISON is brightening as it approaches the sun. Estimates by experienced observers put the comet between 10th and 11th magnitude. That's too dim to see with the unaided eye, but bright enough for color photography through mid-sized backyard telescopes. HIP 102152 Could Be Host To An Earth-Like Planet, Astronomers have discovered the oldest solar "twin," a star identical to the sun. This star, 4 billion years older but nearly identical to our sun, lets astronomers look into the star's ageing process.HIP 102152, located in the constellation Capricornus, helped astronomers solve one mystery about the star at the centre of our solar system. Their research was published in the Astrophysical Journal Letters. A solar twin, according to ESO, has a similar temperature, mass and chemical composition to our sun. These twins can serve as a snapshot of a particular time in the star's history, giving astronomers new insights to how a sun-like star ages. HIP 102152 is approximately 8.2 billion years old, whereas our sun is 4.6 billion years old. Recent news have been mentioning the upcoming flip of the Sun's magnetic poles. What is a magnetic flip and how exactly does it happen? Our sun transfers energy from the core to the radiative zone, and then to the convective zone, and out to the photosphere (the visible disc of the sun). The vertical motion of the plasma in the convective layer causes the magnetic field lines to twist into flux tubes. When the flux tube increases its energy it then rises as an active region. The magnetic field lines arch from these areas from one polarity (+) to the other (-). The magnetic polarities of each active region is similar but reversed in each hemisphere. Peak of shower: August 12-13, 2013. The Perseids are a prolific meteor shower associated with the comet "Swift-Tuttle". 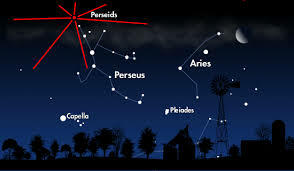 The Perseids are so-called because the point from which they appear to come, called the radiant lies in the constellation of Perseus.The stream of debris is called the Perseid cloud and stretches along the orbit of the comet Swift-Tuttle. The cloud consists of particles ejected by the comet as it travels on its 130-year orbit. Most of the dust in the cloud today is around a thousand years old. However, there is also a relatively young filament of dust in the stream that was pulled off the comet in 1865.The Perseid meteor shower has been observed for about 2000 years, with the earliest information on this meteor shower coming from the Far East. On October 19 2013, a Penumbral Lunar Eclipse will occur, but it will not be visible because it will happen while the Moon is still below the horizon. A TOTAL PENUMBRAL ECLIPSE is a lunar eclipse occurs when the moon becomes completely immersed in the penumbral cone of the Earth without touching the umbra. It is a narrow path for the moon to pass within the penumbra and outside the umbra. It can happen on the Earth's northern or southern penumbral edges. In addition size of the penumbral is sometimes too small to contain the moon. Its width is equal to the angular diameter of the sun at the time of the eclipse, and the moon's angular diameter is larger than the sun over part of its elliptical orbit, depending on whether the eclipse occurs at its nearest (perigee) or farthest point (apogee) in its orbit around the earth.